KoopaTV: ARMS Got Insight From Mario Kart 8, But... Is That Tenuous? ARMS Got Insight From Mario Kart 8, But... Is That Tenuous? By LUDWIG VON KOOPA - Mr. Yabuki was committing clickbait at GDC. 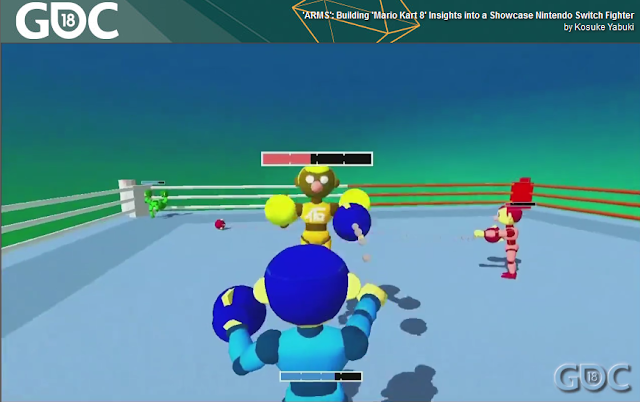 Mr. Yabuki, otherwise known as Kosuke Yabuki, producer of ARMS and also destroyer of Zerk in E3 2017, spoke at the Game Developers Conference 2018 to talk about ARMS in his session, “ARMS: Building Mario Kart 8 Insights into a Showcase Nintendo Switch Fighter”. (Watch it at the GDC Vault for free by clicking there.) Mr.Yabuki is not a no-name Nintendo guy — aside from directing Mario Kart 8, he also directed Mario Kart 7. He knows all about the Mario Kart series. Still... I always thought that ARMS was designed to be a fighting game version of Splatoon, given all the similarities pointed out in the ARMS Direct that featured Splatoon 2 at the end. But Mr. Yabuki is telling everyone it came from Mario Kart 8. I'll go through his presentation and give my thoughts. The first thing Mr. Yabuki said is that Nintendo has a lot of prototypes of different game ideas, and one of those was, “What would a behind-the-fighter camera in a fighting game be like?” Most fighting games are 2D, like Street Fighter or Super Smash Bros.. The reason for that is that it's easy to judge the distance between your attacks and your opponent, but in 3D it's harder. You don't know if your attacks will connect, and people might go and never approach one another. But... what if your attacks are guaranteed to reach? Not only are your attacks guaranteed to reach, but your whole character design changes. Here is where Mario Kart apparently comes in. If you pay attention in Mario Kart, you'll notice that you're not actually moving on the screen. The obstacles and the stage are moving towards you, and you're reacting to that. You do that long enough, and it's a lap. Well, that's apparently how they thought of ARMS. ARMS lacks much movement from its characters — they're staying more-or-less in-place throwing their extended arms at one another. You're reacting to your opponent's arms moving towards you, just like a Mario Kart obstacle. This isn't really an insight from Mario Kart. Every 3D game is like that. That's how you simulate movement, or else you'll end up off the screen. In fact, the stages in ARMS are stationary, while in Mario Kart the stages move. Enemy characters and the environment are sort of different design concepts, are they not? Mr. Yabuki wanted the fists to be easy to distinguish, so you're extending the arms out and it creates a noticeable sense of movement. He didn't mention this comparison, but that's why Red Shells and any bullets in shooters have streaks of light behind them. It's not realistic, but it's so you can discern them. Again, not something really insightful from Mario Kart 8, but he didn't mention this, so not a strike against him. Mr. Yabuki did say, however, that they treated ARMS as part-boxing, part-shooter. Diversity was part of the design of ARMS from the beginning prototypes. Multiple controller compatibility is far from a Mario Kart original. Right now, that's most games on the Nintendo Switch because they're all maintaining Pro Controller support. Mr. Yabuki didn't mention it, but Mario Kart Wii is actually the shining example here, between the Wii Wheel and more traditional controllers. ...Of course, the Wii Wheel is a handicap. Mr. Yabuki also cites having “broadly accessible but deep gameplay” to be a Mario Kart insight, but that's... most Nintendo games. I was supposed to write about this in-depth four years ago, but it's a classic game design of easy-to-play, and hard-to-master. 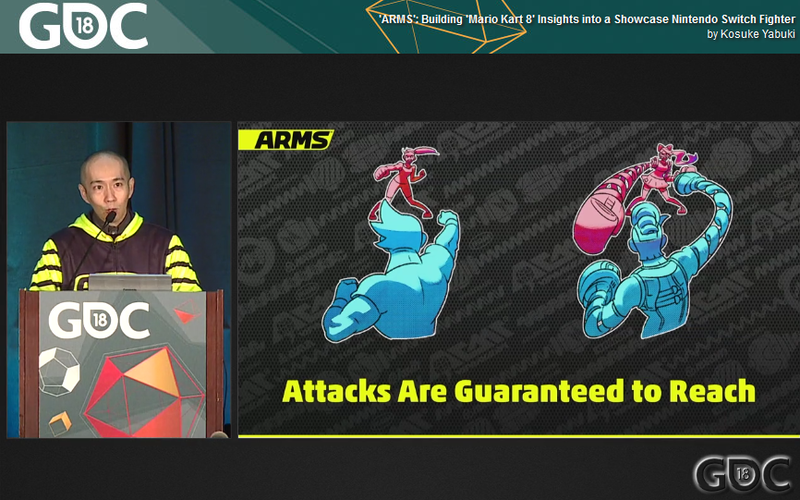 Afterwards, Mr. Yabuki eventually gets to talking about the character design for ARMS. Since they decided on extendable arms, they wondered, what objects are extendable and still keep their form? So they thought of springs, ribbons, chains, bandages, ramen, snakes, jelly, hair... and wannabes who don't have extendable arms but they built robots to make up for that. They said that expands the game's LORE. This is totally UNLIKE Mario Kart 8. In fact, here Mr. Yabuki cites Splatoon having things like rabbits as possible characters, which you can see concept art of here. In Mario Kart 8, all of the characters... well, most of the characters, already existed. There is no form-meets-function that is typical of other Nintendo franchises. That's a very different design experience than Mario Kart 8. Like Splatoon and unlike Mario Kart, ARMS is doing out-of-game things to expand the lore, like this comic. Mr. Yabuki discusses the measures his team took to balance ARMS, and according to the data he presented, the game at a top level is a lot more balanced WITH ALL CHARACTERS, which is an impressive feat compared to many fighting games, especially those like Super Smash Bros. For Wii U. It's also unlike Mario Kart 8, which is filled with Wi-Fi rooms of people playing as Morton Koopa Jr. because he is apparently the best character in the game. That's overcentralised and unbalanced, and Mr. Yabuki didn't do anything about it. What insight was there for that? He also mentioned balance between technique and luck. In Mario Kart 8, the best player doesn't always win thanks to luck-based items. In ARMS, the better player generally wins. I fail to see where the Kart-based insight for that was. Lastly, Mr. Yabuki mentioned how Mario Kart “fostered communication between family and friends.” ARMS apparently does the same. I'm not sure who talks about ARMS among their family. Among my friends, the other KoopaTV staffers, all we do is just say “[expletive] ARMS.” and that's the communication. Ludwig's whole family (except Bowser Jr.) communicated with one another in the making of Mario Kart 8. Mario Kart communication is quite a bit different than that. 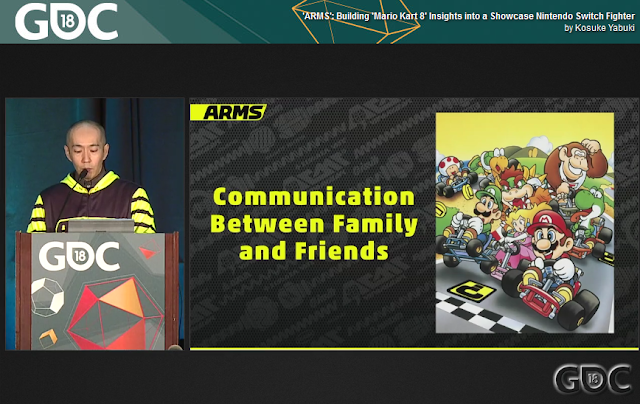 I'll venture to say that, based on what I wrote in this article which was based on Mr. Yabuki's talk, Mario Kart as a whole is quite a bit different than ARMS, and there wasn't a single unique insight from Mario Kart that influenced the development of ARMS. If it did, maybe ARMS would be a bit better of a game. Ludwig hasn't enjoyed a Mario Kart game since Mario Kart: Double-Dash!! despite his own appearance in Mario Kart 8, but he actively hates ARMS. What do YOU think about the influences between the two games, if any? Can you think of something that Mr. Yabuki did not? ARMS later gets a demo, which Mario Kart 8 did not. I'll give the Test Punch demo a try, but I do not think I'm going to enjoy it very much. Arms seems to lack anything exciting or new to make me want to return to it after a couple of hours of play time. Unlike Splatoon which features Splatfests at least once a month, Arms does not have anything that would entice the player to keep playing and rank up. Even its side modes are not very appealing to me. The Testpunch was last weekend and ended already, so... yeah. ARMS now has an event-based Party Crash mode, which is basically a glorified Smash 4 online conquest between two different characters. watched pressentation, mr. kabuki interesting person I think. very different gameplay, Mario kart and ARMS, but various similar places. I agree that Mr. Yabuki is an interesting Nintendo developer; he seems different than the usual image of a Nintendo developer. A next generation one. I just think he was overstating how much developing Mario Kart 8 influenced ARMS.